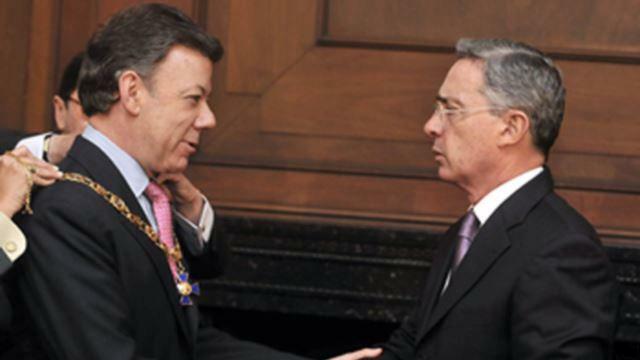 Colombian then-President Alvaro Uribe (right) bestowing a decoration to his in-coming successor Juan Manuel Santos Aug 5, 2010, two days before Santos is inaugurated president. Photo courtesy of the Voice of America. As for the Uribistas and Centro Democratico, what could be their next moves? A peace process would be stronger with the participation of the political opposition—even if in only an observer or “watchdog” role—and would be incomplete without it. But despite repeated attempts (some subtle and private, others public and loud) to get Uribe aboard the Santos-FARC peace train, Uribe has refused so far—whether due to philosophical, political, personal, psychological or emotional reasons, or to a combination of any or all of them. Uribe, though, has apparently coyly indicated privately to some of his friends that while now isn’t the time to board the train in some fashion, maybe later it could be, depending on circumstances and how it would be handled. Uribe has had meetings with Alvaro Leyva, who is a formal adviser to the FARC on judicial and other matters and who has dedicated his life to peace efforts at least since he was mining and energy minister in the Conservative-party administration of Colombian President Belisario Betancur. Uribista Centro Democratico leaders met with another of the FARC’s three formal judicial advisers, Spaniard Enrique Santiago, in Bogota in early February. And Uribe and Centro Democratico leaders have had meetings with the Colombian government’s chief peace negotiator Humberto de la Calle, Interior Minister Juan Fernando Cristo, and other officials of the Santos administration. But while open communication can lead to clarity on respective positions and even to eventually finding common ground, I don’t see on the horizon Uribe hugging the FARC-Santos talks. To the contrary, Uribe has shown himself to be a formidable, tenacious fighter to the bitter end, and as I write this analysis, he is almost surely looking for ways to block an overall peace accord between Pres. Santos and the FARC in its present form. At a recent forum sponsored by his Centro Democratico party, he ripped again into Santos’s peace-process approach, insisting that it will allow impunity, threaten Colombian democracy and that it should be opposed. In my talking with some of Uribe’s friends or reading some Uribista writings, it appears that Uribe’s options for trying to frustrate the Santos-FARC peace talks—which he insists is a “sell-out to terrorism”, though some wonder if envy, ego or hurt feelings may play a part in Uribe’s resistance to them—include: Judicial actions, such as having his arguments against a plebiscite somehow reach the Constitutional Court via indirect or direct motions; an all-out galvanization of his supporters to persuade the electorate to vote against the plebiscite (assuming the Constitutional Court allows it) because boycotting it wouldn’t probably stop it from attaining its lower threshold of voters to make it valid; boycott the plebiscite out of principal and affirm it doesn’t have a mandate, if electorate participation is low, though enough to meet the qualifying threshold; step up his blasting inside and outside Colombia of the victims’/justice agreement and other content he opposes, pointing out controversial items that may raise fears, concerns, uneasiness, discomfort or questions; and continue to try to drive a wedge in the bipartisan strong support in Washington DC toward the peace process, aiming to use, among others, Republican presidential aspirant Senator Marco Rubio, who has shown some sympathy to Uribe’s arguments and whose wife is Colombian-American. The problem with Santos’ plebiscite is that is gives an appearance (rightly or wrongly) of being a slick fast-one by Santos and his Congressional coalition—Congress members seen by much or most of the Colombian public as being “marmaladed (“sweet-greased”)—to hurriedly, conveniently end-run Colombia’s current Constitutional institutionality, in a move more reminiscent of a Banana Republic than of someone who takes to heart that a reason why Colombia’s Constitution has a relatively high bar to make Constitutional reforms is precisely to avoid hasty changes which, in the case of Santos’ proposed plebiscite, could be approved by as little as 13% of the entire electorate, as some say. This could be a recipe for problems—as both the FARC and the Uribistas have warned—because it wouldn’t show a real mandate and could be open to litigation of whether or not it is judicially and politically binding. A limited National Constituent Assembly, as described by Carlos Holmes, an idea Uribe says he could support, depending on how it were handled, appears to be a possible opening to try to get Uribe eventually aboard the peace train. But, so far, as a “red-line” condition, Pres. Santos and his negotiating team reject a National Constituent Assembly, saying that it would be too complex, too long, too cumbersome and could open a Pandora’s box of unnecessary, unexpected consequences, even leading to having to renegotiate the entire peace process from the beginning, wiping out over three years of pain-staking negotiations. That said, some observers wonder if the fact that Colombian chief peace negotiator Humberto de la Calle’s having been an architect of Colombia’s 1991 Constitution—his “baby” and big achievement, one could say—has anything to do in Humberto’s view against a new National Constituent Assembly. Humberto would scoff at such a notion and refer one to his articulately argued El Tiempo op-ed of why a National Constituent Assembly is risky, in his view, and isn’t the simplest, most convenient route. But the FARC leadership’s Constitutional legal counselors have advised it that Constitutional reform via a National Constituent Assembly is the strongest protection and guarantee it can get. Some observers wonder if another FARC reason for a National Constituent Assembly could be FARC wishes to push its own political agenda Chavez-style. When I mentioned quite some time ago to the FARC’s “Ivan Marquez” the proposal by Colombian Senator Jimmy Chamorro of Santos’ “Unidad” (“U”) party that there could perhaps be first a plebiscite, referendum or some kind of electorate consultation followed by a limited National Constituent Assembly, “Ivan” replied to me that that was something the FARC could maybe consider, depending on how it was devised. Maybe middle ground could be sought via some sort of nationwide vote including a proposition to the electorate on whether or not to convene a limited National Constituent Assembly before, during or after the FARC’s laying down of weapons. And if a National Constituent Assembly were to be held in a limited way, to have iron-clad measures to make sure that it wouldn’t spin out of control. Some suspect that Uribista reasons for a limited National Constituent Assembly may go beyond things like ratifying peace accords and judicial and political reforms, and include Uribista wishes for a Constitutional reform to open the door for Uribe to run for a third presidential term. (A try to reform the Constitution for a third presidential run by Uribe was struck down by the Constitutional Court when Uribe was in his second term.) Uribe has said that a Constitutional referendum (not to be confused with Pres Santos’ plebiscite) would be okay—but remember that Uribe may think that he would have a better chance to sink an overall peace accord between Santos and the FARC perhaps by boycotting such a referendum or by having it too heavy with points on which to vote. From my talks with Uribistas, it appears that if Uribe cannot be a spoiler and dash the peace talks, then he at least politically positions himself to attack whatever flaws, glitches and problems—large or small—that would almost inevitably happen during aftermath and implementation of an eventually signed overall peace accord. Uribe could say something like, “I told you so, that there would be these problems,” trying to catch political wind into Uribista sails. The world has seen every time that implementation of peace processes isn’t perfect, and that there are glitches, some minor, some serious, and political opponents naturally try to gain off of them, just as peace-process supporters try to make political hay of the “benefits of peace” and try to paint their opponents as not having wanted the war to end. Would Uribe undermine his own stance, if he himself or other Centro Democratico representatives met with FARC leaders, and not just with the FARC’s judicial advisers? Not necessarily so. Uribistas have talked of having FARC leaders come to the Colombian Congress to express their points of view and face questions. The FARC agrees with this idea, and the president of Colombia’s House of Representatives Congressman Alfredo Deluque of Santos’ U-party has called publicly for that. But Pres. Santos reportedly doesn’t feel it is the right moment, not even to have a live video-conference, yet, between FARC leaders in Havana and the Colombian Congress, even though the FARC’s “Ivan Marquez” was permitted to address European Union parliamentarians via video-conference. Some Santistas worry that if Uribe or his representatives met with the FARC leadership, Uribe could steal the initiative. Santistas also worry that recent meetings with the FARC leadership by peace-process-supporting, left-leaning political party leaders, like Polo Democratico’s Clara Lopez and the Progresistas’ Gustavo Petro, both former Bogota mayors (Clara an interim mayor), who are amenable to the idea of a National Constituent Assembly, could side-track things. Lopez, who placed fourth in the 2014 elections, and Petro were key to Santos winning reelection when they endorsed Santos for the second-round run-off because of their support of the peace talks. So, why not meet with the FARC in Havana Uribe or one of his representatives? An option could perhaps be that Uribe permits someone in his inner circle (if not himself) to make a trip to Cuba to meet with FARC leaders basically to observe things “first-hand,” hear what the FARC has to say directly in private, and spell out personally to the FARC the Uribistas’ positions/conditions. The Uribistas could emphasize to the Colombian public that they spoke hard truths, not sugar-coated, straight to the face of the FARC. Meeting with the FARC doesn’t necessarily mean that Uribistas are complicit, nor agree, with the FARC, although there are some positions on which Uribistas and the FARC coincide. Uribe says that he is looking to build consensus, but how can one be most effective at trying to build consensus if he or she doesn’t try to meet or otherwise communicate with all the relevant participants? American hardline, anticommunist president Richard Nixon met with China’s Mao, when Chinese military personnel were helping the North Vietnamese to kill thousands of American soldiers. (In one of the greatest, boldest moves of modern diplomacy, Nixon had then-National Security Adviser Henry Kissinger pave the way by holding secret talks with Chinese Premiere Zhou Enlai.) And US officials have met with Taliban representatives in Qatar or elsewhere to search for a peaceful outcome in Afghanistan. Since my first visit to Havana in April of 2013, I have talked with FARC leaders of the importance that the views of Uribe and his many supporters be taken into account, and the FARC leaders have said from the start that they would be willing to meet with Uribe or his representatives in the search for peaceful, constructive solutions for the good of Colombia, and that such a meeting would be held in a serious way and not to be turned into a circus. What the FARC or Uribe wouldn’t want to see is where a confidential meeting is held and then audio or video surfaces in public media of it where either side of both feel that things were taken out of context, distorted and sensationalized, such as what happened after what was understood to be a confidential meeting between the FARC’s judicial adviser Enrique Santiago and retired general Jaime Ruiz and other retired officers of the ACORE military retiree association. 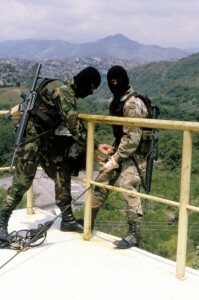 Colombian Army Special Forces commandos train in rappelling maneuvers in Cali. © Photo by Steve Salisbury. All rights reserved. Colombia’s largest retired military organizations ACORE and the Corps of Generals and Admirals of the Active Reserve of the Military Forces can play a very important role in shaping a peaceful future for Colombia. These Colombian retired and reserve military organizations are known to be “the voice” of active-duty military personnel, who cannot publicly speak on political or governing matters. Also, the retired military organizations are apparently influenced a lot by Uribe, and they have evident influence with Uribe, so this could perhaps be an opportunity to try to see how things could maybe develop with the Uribistas. Colombian retired generals have made clear to me, though, that they and their organizations are not Uribistas but that they have a number of positions in common with Uribe. Whoever talks with whom, it is of utmost importance to carefully and articulately phrase communication to clearly get across the message to whom one is directing it. For instance, last summer, the FARC sent an invitation to the presidents of both ACORE and the Active Reserve to interact on issues for the good of Colombia. However, the way the letter was written, retired generals found it insulting and didn’t grasp that the FARC’s intention was to be sincerely inclusive toward them. I know this because I have talked with the FARC leadership extensively about its wanting to reach out to all sectors, especially to the military and Uribe. The Colombian government negotiating team already includes retired general Mora, who was once chief of the Armed Forces, as well as active-duty generals negotiating technical “end of conflict” issues. So, what inhibits retired generals from ACORE or the Active Reserve to go to Havana to talk with the FARC leadership—not to negotiate nor to meddle in the peace talks, but in support of fostering peace, to listen to what the FARC leadership says, to have better understanding and clarity and to look for reconciliation? Evidently, in substantial part, because of fear that their own membership and colleagues could perhaps accuse them of being soft, weak or even traitors. Also, some retired generals talk of “honor” that they are of a Constitutionally instituted Armed Forces, and thus how could they meet with “terrorists” and “criminals”? Labels the FARC rejects. The FARC sees the Armed Forces as being an instrument used or manipulated by “the oligarchy” and corrupt civilians in the state, but the FARC doesn’t have anything against the concept of the military as a sovereign institution per se. A contact of mine who is following the peace process said something-like: “Hey, these guys [the retired generals] can talk about honor all they want, and I understand where they are coming from, but if they don’t get with it, and if they don’t get involved, then they just marginalize themselves, miss a historic moment, and they end up being dinosaurs.” Bottom line is that if military people—or anyone else—don’t defend their own interests and define themselves, then others could fill the void to define them, perhaps in a way of which military people don’t agree. That would be a reason for ACORE and the Active Reserve to discuss these issues cool-headedly, seriously, and fully with their own memberships, avoiding knee-jerk, emotionally charged jingoism. The Left, for its part, has to re-examine how to try to achieve its expressed goal of making the peace process more inclusive. While one of Polo Democratico’s leading figures, Senator Ivan Cepeda, has called repeatedly on Uribe to join the peace process, Cepeda didn’t endear himself to Uribe or bring Uribe toward joining the peace process by launching a Senate debate on Uribe’s alleged links to “paramilitaries,” in which Uribe ferociously defended himself. While Sen. Cepeda is a tenacious lawyer whose view is shared by many that this debate had to take place and that there are a number of unanswered questions, it appears to make it harder now for Cepeda and the Left to reach out to Uribe on this matter. Uribe insisted that since he extradited Mancuso to US prison, Mancuso was sour grapes and slandering Uribe. After the Senate debate, Mancuso, still serving time in US prison, and Uribe reportedly filed law suits against each other. Angry Uribistas personally attacked Ivan Cepeda and swiped that the FARC has a unit named after Cepeda’s late father Manuel Cepeda, who was a Union Patriotica leader murdered by what an investigation showed to be a ring of “paramilitaries” and individuals linked to state security forces. Uribe put resolve into his first presidential campaign in 2002 by refusing to meet with the FARC in the “Distension Zone” during the ill-fated peace talks under Pastrana. But changing circumstances can call for different steps. So, for Uribe to even consider sending an Uribista representative to meet directly with the FARC, he would have to be shown how it would have patriotic and other benefits for Colombia and that the potential upside would outweigh the potential downside. Uribe would have to be convinced that it would be, first and foremost, in Colombia’s best interests and wouldn’t be perceived nor manipulated as being tantamount to giving political cover to Pres. Santos, nor tacit “approval” for the way Santos is carrying out the peace talks, and that it wouldn’t compromise Uribe’s principles in his stance against what Uribe sees as outrageous “concessions.” But such a recipe could be possible, depending on how it were to be handled. The Uribistas could view it as Uribe being a kind of “guarantor” that things don’t go wrong. It is not as if Uribe hasn’t had contact with guerrillas before. When Uribe was president, he held exploratory talks with the ELN in Havana, which foundered, and Uribe sent “peace feelers,” which didn’t spout, toward the FARC via his own High Commissioner of Peace, Frank Pearl, who is now a Santos peace negotiator. “1. Our interest in having a direct and secret encounter with you or your delegates. “2. This meeting would have an open agenda, with the purpose of building confidence between the parties and that may lead to a more detailed and deeper peace agenda in the future. “3. The place of the encounter could be Brazil, given the work together that we have accumulated with this country. “4. Brazil would guarantee inside Brazilian territory the security and logistics of the participants of the secret encounter. An American academic said to me, (paraphrased here): Uribe had it all in his hands. He could have been the big hero here. He had fought hard against the FARC, and he could have claimed winning the peace by joining and influencing Santos to steer the peace talks, the academic emphasized. But Uribe doesn’t see it that way. He seems to see more the lessons of Winston Churchill versus Neville Chamberlain. While Pres. Santos has made public calls to Uribe and others in the opposition to join the peace process, Centro Democratic members complain that Santos has not officially extended invitations to their Congresspersons to go to Havana to meet with the FARC, as he has for some in other political parties. Marta Lucia Ramirez, who finished in third place as the Conservative party’s presidential candidate in 2014, resigned July 9, 2015 from Pres. Santos’s external adviser commission on the peace process because “it didn’t have any impact different than media from the day that it was convened,” she wrote in her resignation letter. “I have arrived to conclude that true will of the government doesn’t exist to take our proposals and sincerely include our sectors that didn’t make part of his [Santos’] reelection…” Pres. Santos denies that he isn’t taking constructive criticism into account from wherever it comes. Whether or not he was influenced by Marta Lucia’s and other opposition recommendations for conditions and time-frames, Pres. Santos announced the March 23 “deadline,” even if the date isn’t met. And Pres. Santos had a pre-condition for formal talks that the FARC cease kidnapping. Many see it as a shame that opposition Congresspersons either won’t go or aren’t allowed to go to meet with the FARC in Havana. Horacio Serpa, a leader of the center-leftish Liberal party, which is part of Santos’ political coalition, found his and other Santos coalition members’ meeting or meetings with the FARC leadership constructive and saw a maturity in the FARC that Serpa hadn’t seen in previous peace processes. Santos’ other coalition pillar, besides his own sometimes center, sometimes leftish, sometimes rightish U party (which Uribistas chafe that Santos usurped from them), is the Cambio Radical party, whose leader German Vargas Lleras is Colombia’s vice president. The center-more-to-right Cambio Radical publicly supports the peace process, but it raised eye-brows that its party chairman, Congressman Rodrigo Lara, didn’t attend the Sept 23 Santos-“Timochenko” Havana ceremony, even though he was invited. Lara later sent another Congressman of Cambio Radical to meet with the FARC leaders. Cambio Radical was a winner in the October 2015 regional elections (the Liberal and U parties claimed they were, too), gaining governorships, city halls and council seats, attributed largely to Vice President Vargas Lleras’ overseeing a program that has provided over 100,000 homes to lower income Colombians. Vargas Lleras has recently had brain surgery to remove a tumor (reportedly benign) and is receiving follow-up treatment, so this has raised questions of if he will be able to run for president in the 2018 elections. While the Liberal party has commented at times of perhaps leaving the Santos coalition over differences on bureaucratic quotas and other issues, it stresses that it will continue to support the peace process, though not give Santos “carte blanche” on it. The Liberal party would like to be allowed more access to its developments, says a Liberal party insider, preferring to remain anonymous. The right-center Conservative party gives conditioned support to the peace process, though there was a split in the Conservative party during the 2014 elections—with the party establishment tacitly, if not openly, supporting Pres. Santos (who generously helped some of its Congressional earmarks) and Marta Lucia Ramirez having the support of the Conservative party base to win the party’s presidential nomination. Marta Lucia supported Centro Democratico presidential candidate Zuluaga in the run-off. She says that she favors responsible peace-process efforts, but has questions about the peace-process direction and wants more vigilance. The current Congressional balance of political forces is very favorable to Pres. Santos. So, if he keeps his coalition happy (including with “marmalade”? ), he should be able to push through his peace-process legislation and reforms. In the 102-seat Senate, his coalition forces have: U party 21 seats, Liberal party 17 seats, Cambio Radical nine seats, and Opcion Ciudadana five seats. The independent Conservative and Verde (“Green”) parties have 18 and five seats, respectively. And while Polo Democratico describes itself as an opposition party, its five seats would vote for pro-peace-process legislation. Centro Democratico has 20 seats in the Senate. There is one seat each for the ASI and MAIS parties. In the 166-seat House of Representatives, the distribution of seats are the following: Liberal party 39, U party 37, Conservative party 27, Centro Democratico 19, Cambio Radical 16, Opcion Ciudadana six, Verde party six, MIRA party three, and the rest divided among other parties.